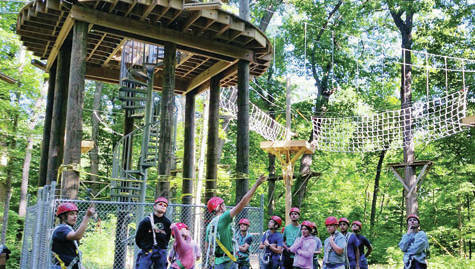 A new high ropes course opened at 4-H Camp Palmer in Fayette on June 6 during Science Camp. A ribbon cutting ceremony, course naming, and dedication to honor Chuck Wurth, a former 4-H camp staff member for 40 years who led the project, is scheduled Saturday, June 23.
https://www.fcnews.org/wp-content/uploads/sites/45/2018/06/web1_High-Ropes-Course.jpgA new high ropes course opened at 4-H Camp Palmer in Fayette on June 6 during Science Camp. A ribbon cutting ceremony, course naming, and dedication to honor Chuck Wurth, a former 4-H camp staff member for 40 years who led the project, is scheduled Saturday, June 23.